Teaser of the Typhoon Lagoon web comic. And thus we start Typhoon Lagoon again, completely remade from the ground up with Sunkra, Milo and Maya whom are joined by their new friends. We hope you’ll enjoy their antics as much as we enjoy creating them. 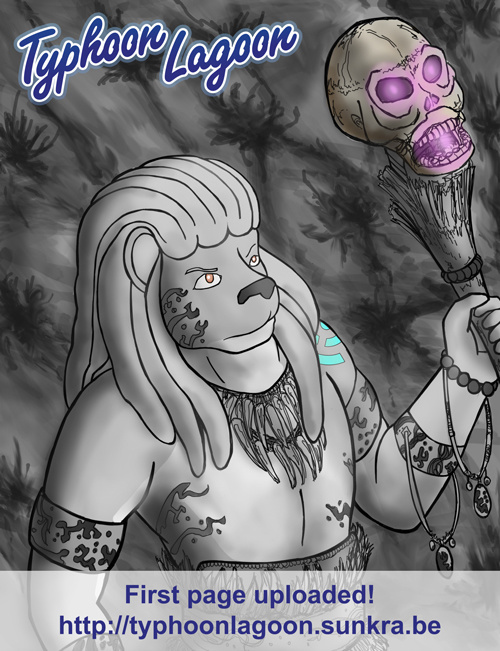 The first couple of pages will be posted within weeks of each other and every new page will be posted to the furry community websites’ galleries a week after their release on the website. After the first month we’ll be posting a new page every two weeks! Also a point of note: we’ll be holding a contest to celebrate our new release soon, the prize of which is the first cameo slot of the reborn Typhoon Lagoon comic! Don’t miss it, more information soon in the journals on the furry community websites. For those of you who want to thank the artist whom made it possible for Typhoon Lagoon’s rebirth, go watch him on FurAffinity, perhaps have a look through his gallery and leave a favorite or two: https://www.furaffinity.net/user/spypolygon .